As we continue to keep an eye on the ever-changing requirements set forth by TRID, many in the real estate industry are happy with the two-month extension of the rule, but are still looking for an official hold-harmless period for enforcement. The finalization of the extension has been announced by the CFPB, along with technical corrections of two provisions. The official enforcement date is now October 3rd, 2015 with the delay attributed to an administrative error that would have delayed the effected date by two weeks. The CFPB decided the delay would place the effective date right around the time students would be re-entering school, and decided a two-month delay would ensure a more smooth transition for the industry. The effective date was then moved again to October 3, 2105 to give the industry the weekend to test their updated systems. With the changing effective date of the rule, many were distracted from the inevitable issues that will arise when this effective date hits. The real estate industry has joined together in support of an official hold-harmless period for TRID enforcement. Prior to the news breaking of the administrative error, CFPB Director Cordray sent a letter to members of Congress stating the CFPB “will be sensitive to the progress made by those entities that have squarely focused on making good-faith efforts to come into compliance with the rule on time.” In this letter, Director Cordray hints at leniency, but does not specify any terms or the period of time it would be effective for. The bill, titled H.R. 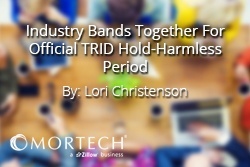 3192, calls for an official temporary safe harbor from enforcement of the TRID requirements until February 1, 2016, giving the industry time to adjust to issues that may arise after the effective date. It includes that no suit may be filed for violations so long as a good faith effort has been made to comply with the requirements of the regulation. We look at industry happenings and updates every week. We've been chronicling TRID developments as they happen, which you can continue to read up on here.